When you go grocery shopping, you read the nutrition labels on food packaging to help you decide what you want to buy. But the nutrition label on your dog’s food might look complex and undecipherable by comparison. Read this guide to help you understand what you’re looking at. On ingredient lists for your food, the ingredients are arranged in descending order according to the percentage of weight they are in the product; for example, if the first ingredient on a jar of salsa is tomatoes, you know most of the product will consist of tomatoes, with the rest of the ingredients on the label making up the remainder of the product’s volume. The same is true for the label on your dog’s food. If the first ingredient is chicken, you know that a significant portion of the food consists of chicken. Look for real meat in the ingredients list; it includes the proteins and amino acids your pet needs to stay healthy. The guaranteed analysis chart lists the minimum and/or maximum percentage of nutrients in a food, such as protein, fat, fibre and moisture. The guaranteed analysis for dry food and wet food will look different; this is because the moisture content in the wet food is so much higher. If you want a way to accurately compare the nutrient profiles of wet food and dry food, you can find a formula to help you here. Some pet foods contain animal by-products. NUTRO™ Dog Food does not contain chicken by-product meal. Our formulas use real, high-quality protein, such as farm-raised chicken and pasture-fed lamb. The Association of American Feed Control Officials sets nutritional standards for pet food. 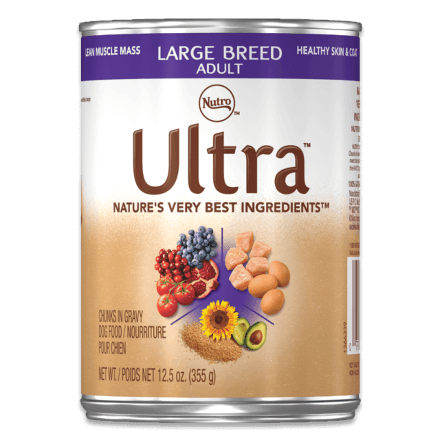 There are currently two separate nutrient categories — one for growing puppies/gestating-lactating mothers and one for adult maintenance. All NUTRO™ Dog Foods meet the nutritional levels established by the AAFCO Dog Food Nutrient Profiles. 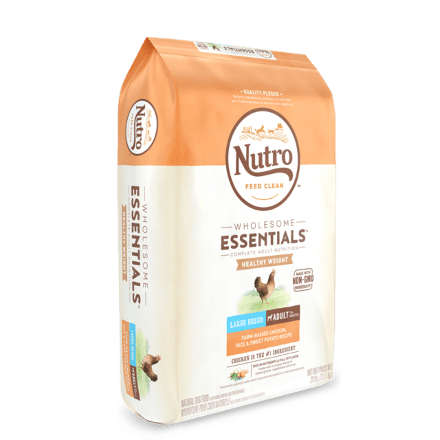 If you have any questions about the ingredients in NUTRO™ Pet Food, you can consult our Ingredient and Nutrient Glossary. If your dog is the dog that has everything, check out our guide to some fresh ideas for holiday stocking stuffers or gifts for any occasion. Chow time! It’s probably your dog’s favorite time of day, right?